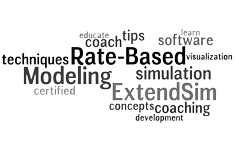 Learn how to use the discrete rate (rate-based) capabilities of ExtendSim AT. Discrete rate modeling simulates rates of flow that change when events occur. This is the most common, and most efficient, method of modeling high-speed, high-volume systems such as packaging lines, mining operations, the manufacturing of powders and fluids, chemical processes, and so forth. Completion of the Essential ExtendSim Training, or, on instructor approval, a comparable proficiency is absolutely necessary before taking this course. $800 for the one-and-a-half day workshop.